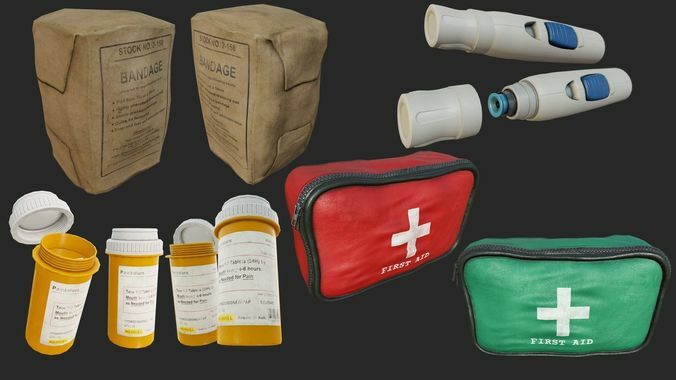 Very Detailed Low Poly First Aid Collection with High-Quality PBR Texturing. Painkillers (Interior Version has some pills in the top of the bottle, it is not filled up for better performance, and some of the not visible polygons of the pills is removed. Autoinjector (the lid can be removed, Perfect Health Regeneration, or Adrenalin Shot. Sculpting done in Zbrush and Retopologized, High Poly mesh Baked and PBR Painted .